My beautiful Treasure and Vinny accompanied me this past weekend on an adventure! Treasure and I are very accustomed to traveling together, and Vinny has traveled with us a few times during his puppyhood, but he had many firsts during this trip. I am so very proud of how he responded to all the new experiences! I wondered how he would do - visiting a museum, going to a large dog show, and staying in a hotel. 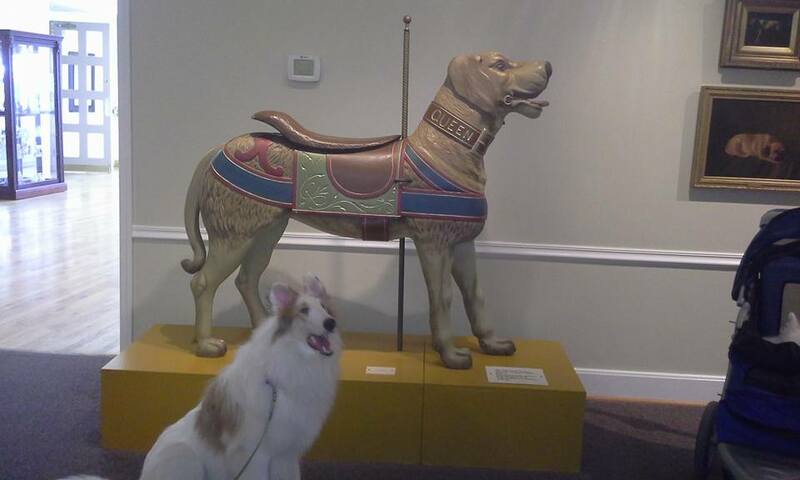 Our first challenge was learning to navigate together through the Museum of the Dog - Treasure in her stroller and Vinny learning to walk beside it and keep his toes out from under the wheels! This was the first time Vinny would be walking with the stroller. After only a couple times of walking in front of the stroller and tangling his leash, and a few times of his toes getting bumped by stroller wheels, Vinny said, "Piece of cake, Mom!" He walked like a pro. Both dogs were a bit puzzled by the numerous dog statues that smelled a little strange. I couldn't help but wonder what my other dogs would have thought, since they can see and some of the statues were large and even a little scary looking! 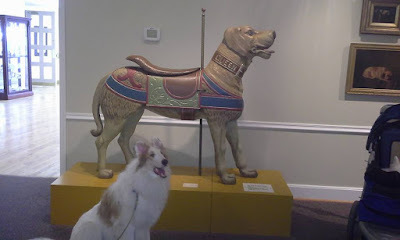 Of course, Treasure and Vinny are both blind and deaf, so they didn't know what the statues looked like, but they spent a lot of time sniffing them and trying to figure out what kind of dogs they were! I didn't think about the fact that Vinny had never been on an elevator before until we were about to step onto the one in the museum. He went into it easy enough, with no hesitation, but as the elevator began to move downward and the floor moved down under his feet, he looked at the floor with a puzzled look. I was pleased to see that he wasn't very concerned about it - probably due to all the work we do with moving surfaces. Going up didn't produce the same puzzlement. He acted just like a pro. When we got to the hotel later, there was once more where he pondered the elevator moving downward, but after that, he didn't even seem to notice anymore. He checked out the hotel room when we arrived, just like he had been doing it all his life. Very confident, sniffing every corner and all the furniture, finding his water bowl, playing with his toys. He did take more trips to come check in with me than Treasure did, wanting to make sure I was OK, no doubt. And, while Treasure fell quickly asleep next to me, Vinny continued to check on me all throughout the night. He would sleep for a bit and then come up to poke me with his nose to be sure of where I was. I guess he didn't want me to be scared in a new place. That was very thoughtful of him! Deb, I love this story and the pictures, too. I am often surprised by how unafraid Spirit is in totally new situations and experiences, too. Wonderful dogs. I feel blessed to have two. Hi Marjorie! The classes are actually online, so anyone from anywhere can join us! https://uniquely-paws-able.teachable.com/ Hope you are all doing well!